9th Avenue. 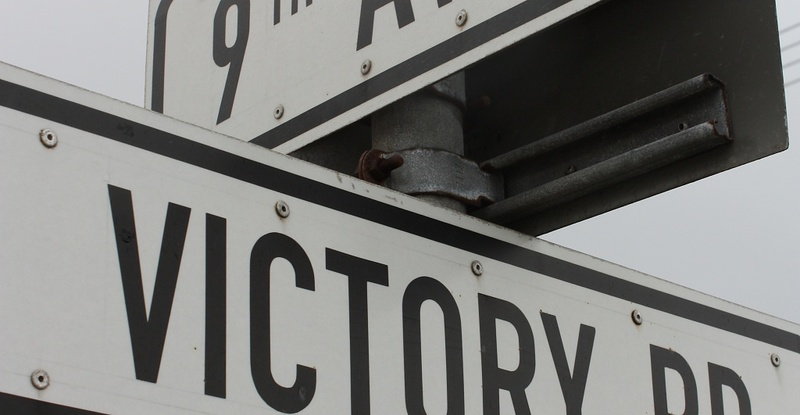 Victory Rd has 9 letters. 9 rivets. This is a sad place. Dry or muddy depending on the season, windswept and dirty, the irony of the name Victory is not lost. I went looking for 9, 9th Ave, but that's even sadder. Thanks for your sweet comments.....love your pics! Sorry to read about this "sad little area" when your photo is so completely Brilliant! I've found it interesting, several times over, how people elivate the ordinary into an exceptional photograph! Even without the number theme, I'd really like the composition of this! some times we dont' have to travel very far to encounter sad places. This was a good idea for the 9 theme. Thanks for your comment on my photo today, I read the article you sent me a link for and you're right it was a good example of when a person's photo that they didn't agree to pose for shows up in places they didn't expect or consent to see it. I have to admit I probably wouldn't have been very happy about that either if I was the guy. Markets are risky places for picture taking. I've taken them in West Africa, Europe and Southeast Asia and even with a friendly chat and smile you never know how it will be received if you run around snapping pictures in a local market. I will probably end up posting market pictures soon cause they are interesting for folks who are used to shopping that way.